In this week's edition, based only on the limited selection of charts, you would say that price is very strong, and that it's at least partly justified by improving fundamentals. While increasingly bullish sentiment and overbought indicators open up the possibility of a short-term correction, if the improving fundamentals trend is sustained then prices can probably drive higher near term. 1. 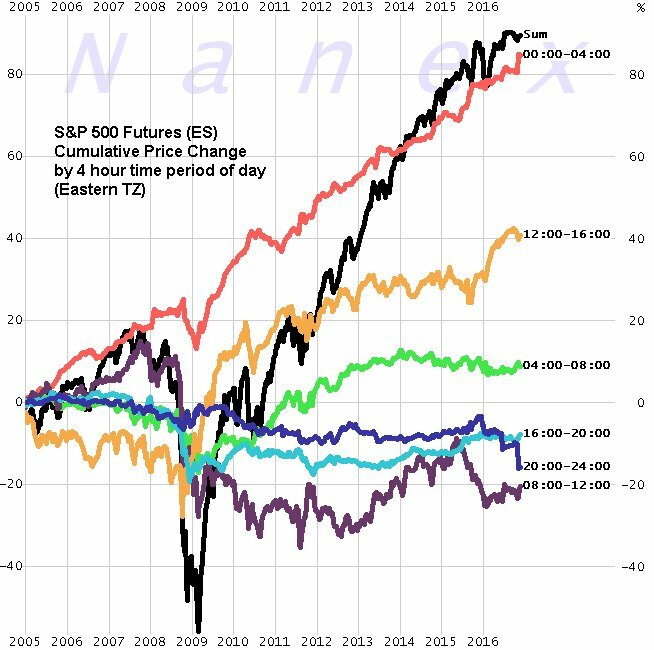 Pundits vs the S&P500: This interesting chart (thanks Jon Boorman (VIEW LINK) ) overlays a selection of big and bold bearish broadcasts of several of the usual suspects. There's not really much else to say on this except to be wary of of pundits bringing prophecies. More often than not these guys are talking their book or angling for headlines and publicity than giving a well reasoned and sound investment case, so as with all forecasts, treat them with caution and a large grain of salt. Bottom line: Beware of predictions. 2. A new 1 year high: Thanks to this chart by Nautilus (VIEW LINK) , it's clear that new 1 year highs are not a bad thing. While they sometimes occur near the top of the market, the historical stats suggest that the majority of the time they're actually a harbinger of more positive returns to come. An interesting historical observation worth noting. Bottom line: New 1 year highs for the S&P500 are a positive sign more often than not. 3. 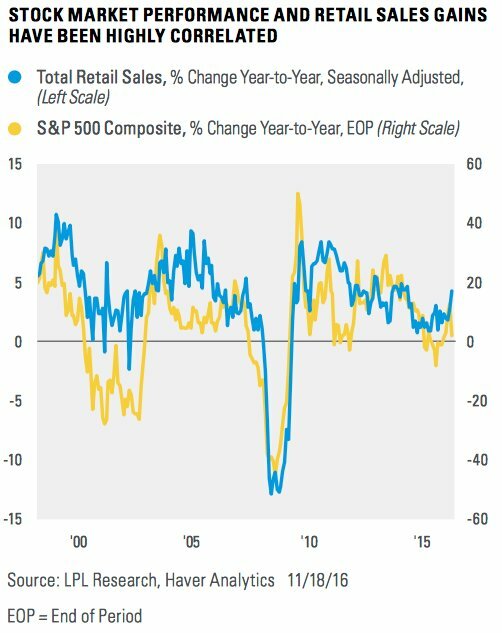 Retail sales vs the market: This graph from LPL Research (VIEW LINK) shows an interesting correlation between the year on year change in retail sales compared to 1-year returns for the S&P500. As you might expect, there appears to be a decent correlation... It makes sense in that retail sales or consumer spending will reflect the broader health or otherwise of the economy, which in turn will impact on earnings of S&P500 companies. On the flipside, gains in the stock market will also have a confidence effect, which may make consumers more likely to spend, so there is a somewhat circular or 2-way argument. Either way, with retail sales growth looking to be picking up it's going to be a tailwind for the market. Bottom line: Improving retail sales growth is a tailwind for equities. 4. 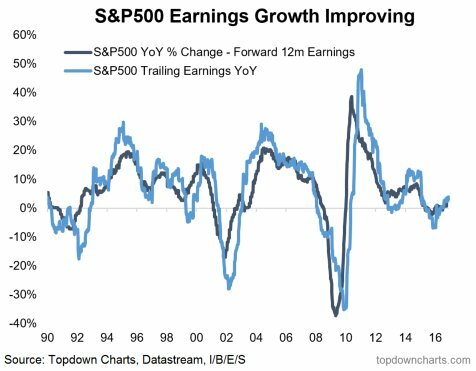 Earnings growth: After spending a period in contraction - largely as a result of the commodity crash (energy being the biggest loser; materials also suffering), S&P500 earnings are now back to growth on an annual basis. Clearly the earnings recession is now over. The reason why this earnings recession didn't have the same catastrophic impact on the market as the 08/09 or 01/02 earnings recessions did was because it was primarily driven by the commodities sectors (with the strong dollar also playing a role). In other words, it was more of a sector or company specific issue rather than a systemic issue or economy-wide recession. In some ways it's similar to the brief 98/99 episode. Bottom line: The earnings recession is over. 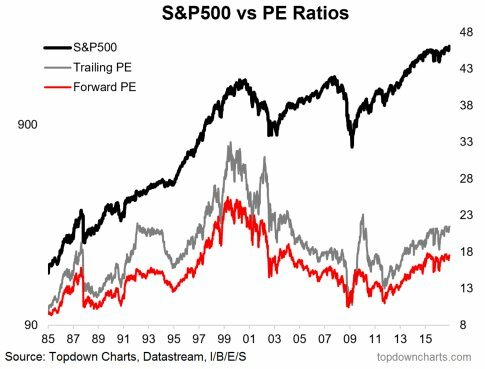 Bottom line: PE ratios continue to trade around the upper end of the historical range. 6. 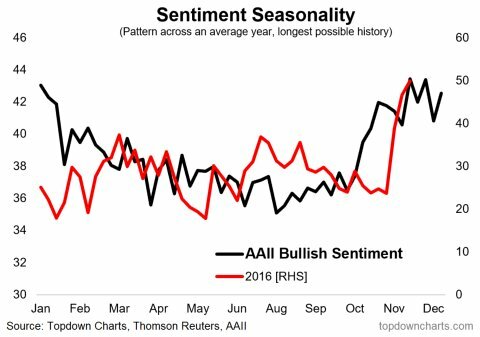 Sentiment: The latest AAII (American Association of Individual Investors) investor sentiment survey showed bullish sentiment reaching its highest point since January 2015, with the majority now clearly in the bullish camp. 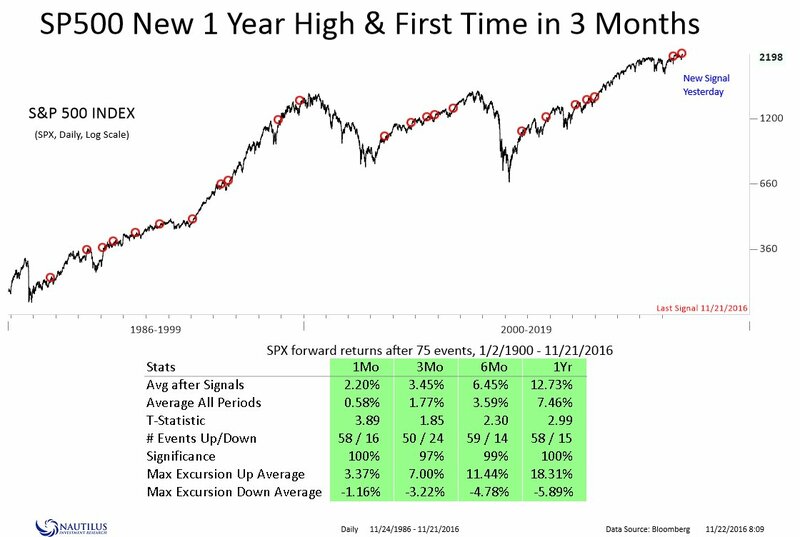 But one interesting observation is that historical seasonal pattern (like the market - see the next chart) is for bullish sentiment to rise in the last part of the year. So it's not at all unreasonable to expect more bullish sentiment around this time of the year. That said, sentiment remains an important market feature to monitor in order to detect tradeable extremes. Bottom line: Bullish sentiment has spiked. 7. Stock market seasonality: The historical seasonal pattern for the S&P500 is that it usually has a good start to the year, an average middle of the year, and a solid finish to the year. There are always exceptions, but 2016 has proven to be unexceptional on this basis. 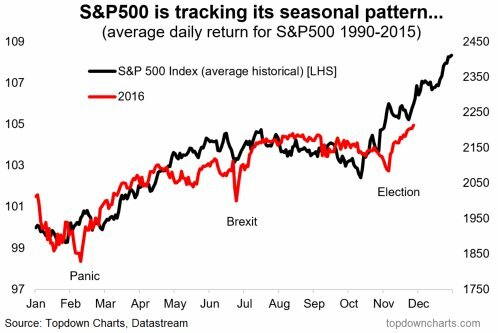 Aside from a few notable deviations, the S&P 500 has been tracking its seasonal pattern reasonably well this year, and if you took the below chart literally it would imply a run towards 2400 by year end (an observation, not a prediction). Bottom line: The share market usually sees seasonal strength around this time of the year. 8. Overbought RSI's: This chart from indexindicators.com shows about a quarter of the S&P500 are now into overbought territory (14-day RSI tracking above 70). Historically you get spikes in this particular breadth metric in one of two situations: 1 when the market is particularly strong e.g. during a broad-based bull market or rebound, and 2 when the market has become too strong and has gotten ahead of itself. Looking at the chart you can see a few examples of both types. Given the market has come from a selloff my view would be that it's more a sign of strength rather than a sign of an imminent correction. Bottom line: A quarter of the S&P500 are showing up as "overbought" based on the RSI. 9. Cash on the corporate sidelines: This graph (VIEW LINK) the proportion of SPX companies' assets being held as cash. You can understand why some would want to run higher cash balances given the trauma of the financial crisis (and other issues like tax could also be at play), but it makes you think when you see interest rates at record lows, and companies still wanting to allocate capital to such a non-productive investment. In fact, a slightly facetious angle would be to quip that Fed rate hikes would be good for corporates because it would mean their sizable cash holding would end up working harder! 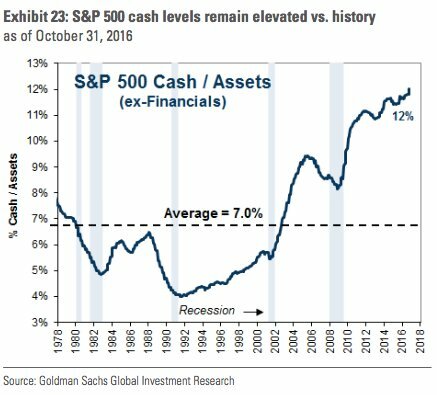 Bottom line: Corporate cash allocations remain elevated vs history. Bottom line: There is considerable (cumulative) variation in returns for SPX futures by time of day. There's a few things going on with price: new highs, defiance of pundits, overbought conditions, and seasonality. Taken together I suppose you would say that the market is strong, and could stay strong... The key will be to watch for the point where it gets too strong too fast and where sentiment becomes too optimistic. On the fundamentals, again there's a few things: improving retail sales growth, improving earnings growth, and cash on the corporate sidelines. Overall, on only these few factors (and there are many other factors...) the picture looks bullish, certainly something that could support high valuations and higher prices if sustained. Overall, based only on the limited selection of charts collected in this week's S&P500 ChartStorm you would say that price is very strong, and that it's at least partly justified by improving fundamentals. While increasingly bullish sentiment and overbought indicators open up the possibility of a short-term correction, if the improving fundamentals trend is sustained then prices can probably drive higher near term.